A funny thing happened since my last posting: I woke up and summer was gone – a veritable chill is in the Paris air, my calendar says September—4th already!—the city is rubbing its weary sun-drenched eyes and waking up, the restaurants are opening, all is good with the world. I know, I must sound insane, but when it comes to summer, I say ‘good riddance!’ Paris is like deadsville, daddy-o, during the summer. All this is just a reminder that I better hurry up and finish my summer meanderings before they become irrelevant – I promised a “summer seasonings” part 2, and you’re going to get it. Here I’ve got two more August restaurant visits for you, one good, one bad. The good one, I’m pleased to report, was very good. I promised Co. I’d try to go easy on the bad, so let me just say that the bad one was, well, bad. 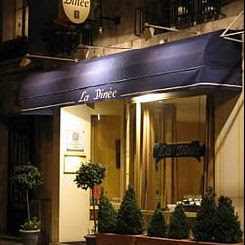 First, the good news: La Dînée is one terrific restaurant. Not that this is new news for me and Co. If you check my ‘best of 2007’ installment, you indeed will find La Dînée listed. This is a restaurant we had visited 3 or 4 times in the past, always a good experience, but I had so much subsequent difficulty reserving—poor timing (holiday closings, renovations, etc. )—that I just sort of gave up. So it was with great surprise when I took a chance and telephoned a little past the mid-point of August and found the restaurant had just re-opened from its annual summer closing. Check out the accompanying photos, pirated from La Fourchette.com, and you’ll observe that this is a finely-appointed, but rather understated venue, just recently redecorated and rearranged. Not surprisingly, given the time of year, ours was one of only three occupied tables during the evening, so there was plenty of elbow room. We went with the 35€ three-course menu. I enjoyed my appetizer of dorade salade with a Russian dressing and vinegrette sauce, but the clear highlight was Co.’s soupe de melon au gingembre with vegetables and gambas tempura. This was an inventive and impeccable dish – perfectly balanced, with the mutually reinforcing tastes of the melon, ginger, and shrimp tempura resulting in Co.’s curt but informative one-word review: ‘excellent.’ We both opted for fish as our main dishes – Co. had the salmon with potatoes, snails, and tapenade, the fish grilled to a crusty topping; I went with the espadon (swordfish) with vegetables, served cold ala marinèe. On paper (or should I say, computer screen), these dishes must sound pretty ho-hum, but trust me, they both were excellent. Desserts consisted of peche caramelise with a waffle and tea ice cream – that was one. The other was nougat glace with strawberries. I’m a sucker for nougat glace, but I had to agree with Co. that her caramel peach waffle tea ice cream concoction had the edge for inventiveness. An odd choice for red wine – a S. African bottle, Pepper Pot 2007 (27€). I was a little horrified when the waiter unscrewed the top, but it led to an interesting discussion about the trend, especially for imported wines, to forego the cork. To our surprise, our server (probably one of the owners) was strongly in favor of this trend, suggesting that it held the taste better. A topic for another installment, perhaps, but by the time our bottle was about 7/8s empty, we began to overhear a conversation that had started up between the patrons at the two tables across the room. Short story, they were sharing their favorable impressions of their dishes, so what the hell, I chimed in and talked up the melon soup. It was at that point when one of the two guys at the far table started to wax eloquently about the capaccino de morelles he had enjoyed during a previous visit, imploring our server to put it back on the next menu. I mean, this guy was in near ecstasy as he closed his eyes and pondered that dish. Maybe it was the time of year, the sparse clientele, whatever, but I ask you, when was the last time you visited a restaurant and a spontaneous conversation broke out among the customers about how great the food was? Case closed. Now for the downer, the Bistro de Breteuil in the 7th. Located in a rather animated square (the place de Breteuil, which is actually round, making this a round square) strikes me as something of a Paris institution—packed terrace deep in the heart of summer and boasting one of the best deals in town: 38€ for everything. Everything, including three courses, a half bottle of wine per person, water, bread, coffee. I cannot deny that this is a good deal, but given the quality of the food, I’m reminded of that Woody Allen joke about a restaurant that one patron proclaims as having bad food and her companion pipes in, ‘and such small portions.’ My appetizer of tartar de bar would have been fine if it wasn’t accompanied by raw bean sprouts. Don’t get me wrong, I love tartare de bar and I love bean sprouts, but a suggestion to the chef: not together! True, I already was in a foul mood having been curtly rejected by the waiter when I asked for a table on the terrace (‘plein!’) and then, resting my menu against a lineup of a small vase with flower, salt and pepper shakers, and whatnot, aforesaid list of items proceeded to tumble off the table onto the floor like dominos. 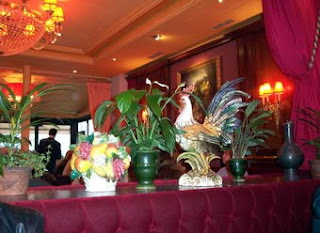 The small splash from the vase seemed to have reached the ankle of the woman at the table to my right. Did you ever go to a restaurant where your first impulse was to leave? Now you know how I felt. For my main dish, I had a plateful of steamed gambas with a sort of hosein sauce for dipping. Overall, the gambas weren’t bad, but the accompanying vegetables –thin, long strips of carrot and zucchini –tasted as foul as my mood. Two bites was all I could fathom. Co. wasn’t nearly as critical as I was about the food, but for the life of me, I can’t remember what she ordered. I do know that she liked her dessert, and if Co. enjoys her dessert that tends to bias her experience of what preceded it. In science they call this a ‘recency effect.’ Co. also was lucky enough to be seated so that she faced the terrace, with its relatively young and finely appointed clientele happily pontificating as relatively young and finely appointed Parisians are oft apt to do. Me, I was facing the dimly-lit, 18th century dining room, where the clientele coincidentally also had that 18th century look. 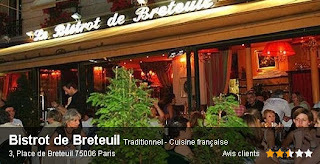 The patrons looked like regulars, as in regularly eating at Breteuil for the past 70 years. For some reason, I kept thinking of a geriatric all-you-can-eat Las Vegas hotel restaurant. Don’t ask me why. Anyway, Breteuil, I am sure, will continue to pack them in, young and old, long after the memory of that splashing vase has been purged from my memory. As it says on their card, ‘Les Bistros qui ont Tout Compris.’ And with a deal like that, who cares how big the portions are?